Following up on a report of a Greater White-fronted Goose in Elizabethton, I visited the Great Lakes pond on the campus of Northeast State Community College. 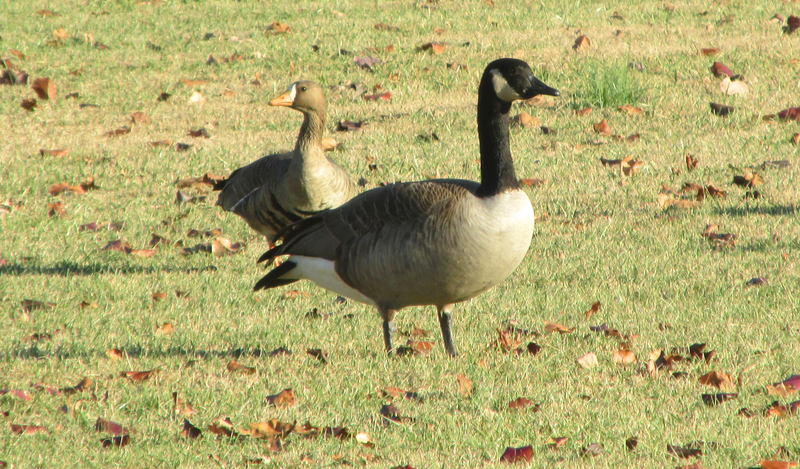 I found the goose on Saturday, Dec. 13, among a flock of about 250 Canada Geese. A Greater White-fronted Goose grazes in the company of Canada Geese at an Elizabethton pond. 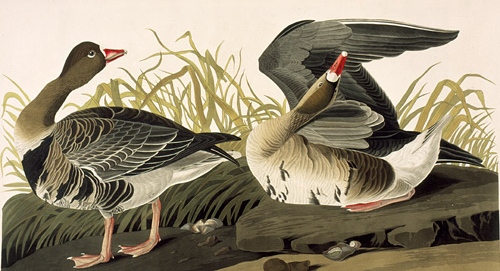 Early American naturalist John James Audubon painted this pair of Greater White-fronted Geese. The Greater White-fronted Goose breeds in both North America and Europe and Asia, and birds spend the winter throughout the United States and even Japan. Most nesting in North America takes place on the North Slope of Alaska and across the western and central Canadian Arctic. Wintering habitats include coastal marshes, wet fields and and freshwater wetlands. The large pond on the NSCC campus has attracted other visits from Greater White-fronted Geese in recent years. The pond has also attracted Ross’ Goose, Snow Goose and a variety of waterfowl. 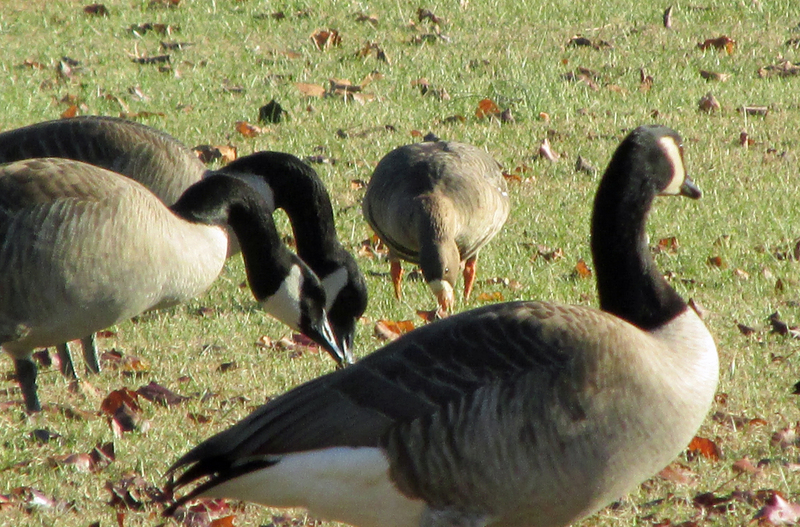 The Greater White-fronted Goose is much smaller than the typical Canada Goose. I received a fun email from Judy and Bill Beckman recently. 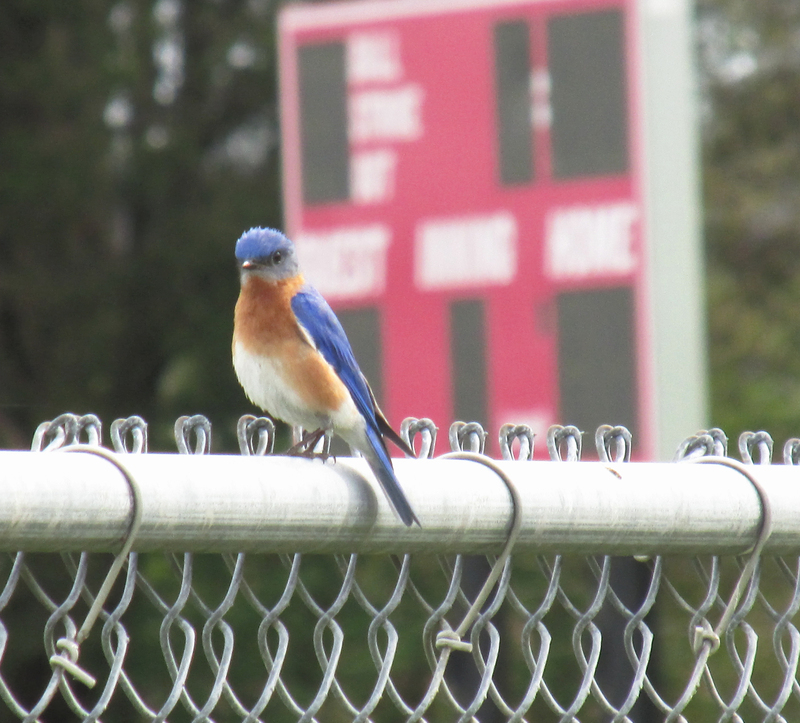 Eastern Bluebirds are year-round residents in Northeast Tennessee. I always love hearing from the Beckmans, who reside on Spivey Mountain in Unicoi County. They’re always seeing interesting birds. I haven’t seen many bluebirds or waxwings so far this winter, but I will be taking part in the annual Christmas Bird Count conducted by the Lee and Lois Herndon Chapter of Tennessee Ornithological Society. Perhaps I will see some of those birds during the count. Matt Cahill posted on bristol-birds about some birding he recently enjoyed in Unicoi County. Bristol-birds is a list-serve that allows birders to share bird sightings with others on the network. Photo by Bryan Stevens A Ring-necked Duck swims on a pond in Erwin. 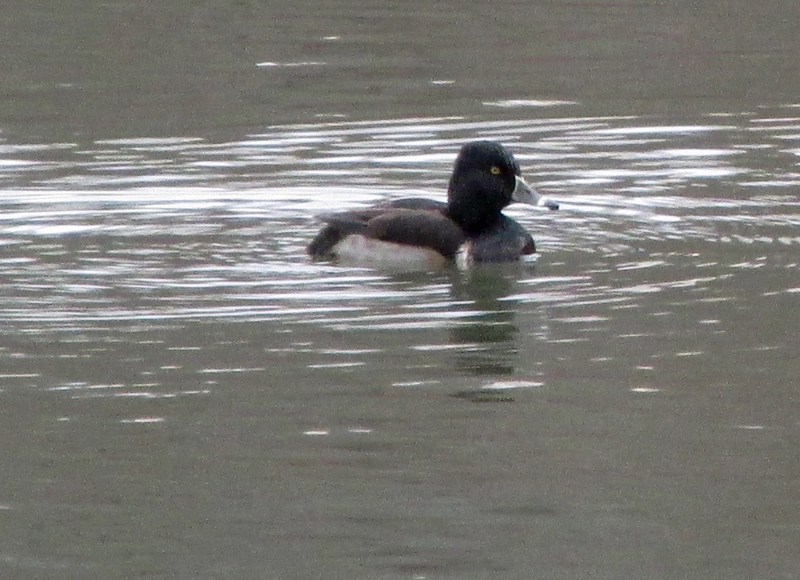 While at Erwin Fishery Park on Dec. 7, he saw a Ring-necked Duck, four Killdeer and a single Red-breasted Nuthatch. In addition, he found a large flock of about 70 Pine Siskins in the park. The pond at Erwin Fishery Park is a good place to look for visiting waterfowl. So far this winter, I’ve observed Bufflehead, American Wigeon, Wood Duck, Hooded Merganser, American Black Duck and Gadwall at this pond. I’ve also been seeing Pine Siskins, Purple Finches, House Finches and American Goldfinches at my feeders at home. I’ve also seen White-breasted Nuthatches, but I haven’t seen any Red-breasted Nuthatches so far this winter. 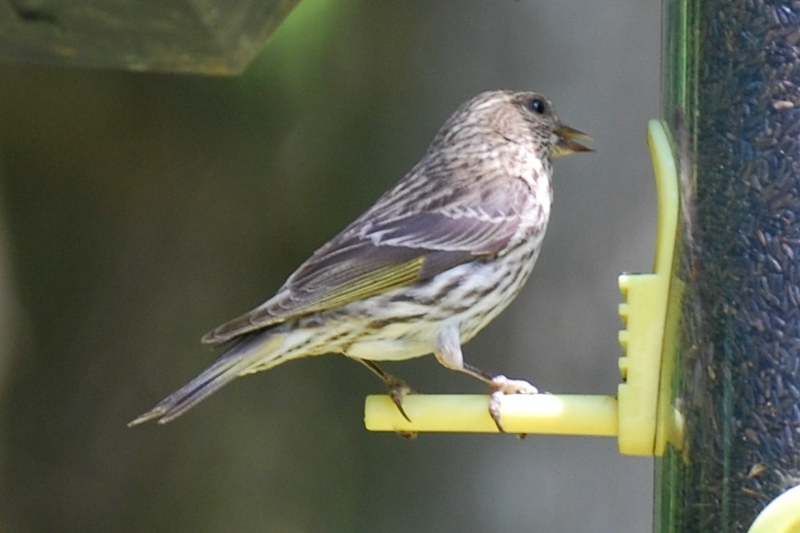 A Pine Siskin visits a feeder. Friend Stevens on Facebook at https://www.facebook.com/ahoodedwarbler. He is always posting about local birds, wildlife, flowers, insects and much more. If you have a question, wish to make a comment or share a sighting, email ahoodedwarbler@aol.com. This entry was posted in Birding, Birds and tagged Birds of Northeast Tennessee, Greater White-fronted Goose, Pine Siskin, Winter Wren on December 14, 2014 by Bryan Stevens.